Our journey up the coast of Croatia started in Dubrovnik. About halfway up the coast we hit Split, the second largest city in Croatia. It was from Split that part 2 of my story begins that originally ran in ATOD Magazine. Beaches, Roman ruins, trendy cafes and boutique shops greeted us in Split, the second largest city in Croatia. Split is in the center of Dalmatia and home to the third largest port in Europe, after Athens and Naples and where our cruise up the coast of Croatia continues. Take a tour of Diocletian’s Palace. The palace was built by the Roman Emperor in 4th century AD. The ancient fortress has become the old town of Split and you can wander the narrow streets to find shops and restaurants. Croatia had been on the top of my list of places to visit. Just across the Adriatic from Italy, it has become a popular travel destination. And, a few months ago, I was lucky to finally go. My mom and I took a “girl’s trip” and traveled up the coast of Croatia by boat, stopping in more than ten ports. I wrote about our journey in ATOD Magazine and here is Part 1 of Cruising up the Croatian Coast, exploring the history, cuisine, market places and more. What was once considered off the beaten path, Croatia is one of Europe’s hottest destinations. Perhaps it was the filming of Game of Thrones that opened the world’s eyes to the beauty of the country but regardless of what it is, people are flocking to the country in droves. Croatia had been at the top of my list to visit for the past few years. But with 21 regions and 1185 islands, 67 of which are inhabited, deciding where to go and what to see was overwhelming. 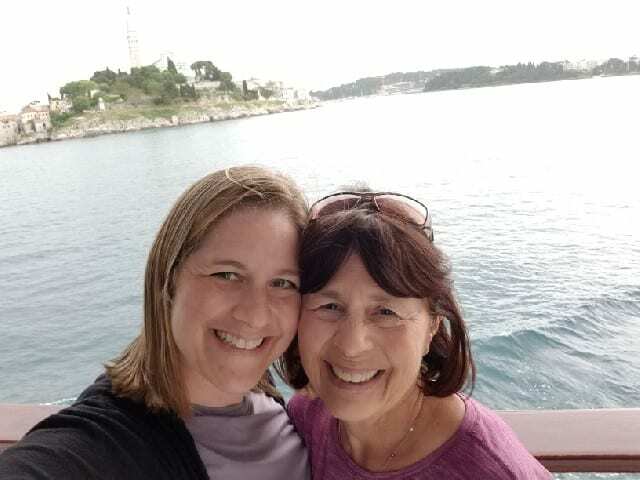 To simplify the challenge, I invited my mom to join me for an Adriatic Sea cruise up the coast of Croatia.